Companies who have been running a bot for a while will realize that the main reason a bot doesn’t get what users mean is their use of spelling. They usually make typos and also mix languages. 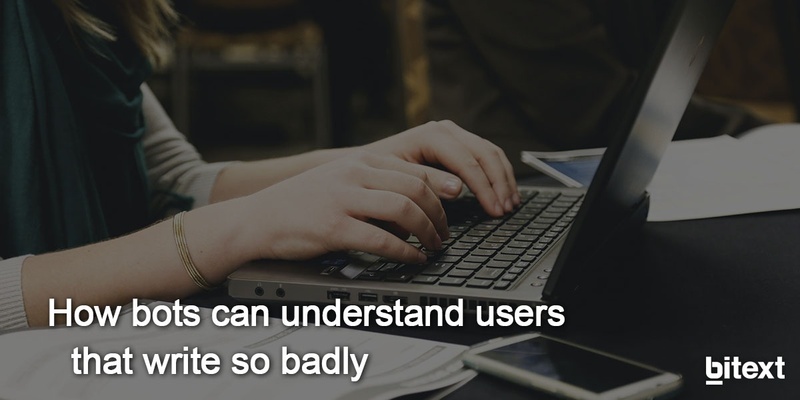 To be honest, users don’t make it easy to be understood. This is the one of the biggest challenges a bot developer must face. You cannot force users to write grammatically correct because they are not realizing what they are actually writing. Users just realize how annoying it can be to get a “I don’t understand” answer whenever they interact with your bo . This fact makes user experience falling short of expectations and, frequently, turn into a double-edged sword since chatbot interactions can either lead users to purchase goods and services or they may, in turn, scare them away as bad customer support does. Just ask yourself: How can this be solved? Your first answer may be “my bot needs more training”. However, your second question will be: How much time and money do I need to make my bot understand thousands of possible misspelling mistakes users do? That will be quite pricey! Nevertheless, it can be easily managed with a linguistic approach. Bitext uses NLP tools to success in the usual “mistakes” people make when talking to a bot. Mispelling: Users may not pay attention to grammatical or orthographic errors while typing because they are familiar with texting abbreviations when using messaging apps. If your running your bot in English but your users are from all-over-the-world, you’ll see this situation so frequently, as no native speakers are prone to make this kind of mistakes. Thanks to our technology, your bot will detect any typographical mistake to easily understand what a user needs even if there are such typos. Language mixes. Languages often borrow words from one another, especially in this era of globalization. A user may write in English but use some words in Spanish or French. In this case, a multilingual chatbot will detect the language used and answer consequently to guarantee a successful conversation. This language detection tool is also useful for monolingual chatbots since it will make your bot able to recognize a different language and answer back with a 'sorry, I don’t speak ... yet, could you write in English, please?'. Our technology allows chatbots to identify more than 50 different languages facilitating a better understanding of the whole query. Endless queries. Is your bot not able to cope with a big amount of data as shown above? Don’t be afraid! To solve this issue, our tool splits a query into shorter sentences so that the chatbot will identify what the important matter is and what is just a filler. Users do not necessarily want chatbots to talk like humans, but they do want to be properly heard and understood. Therefore, it’s about time for companies to get under way and invest in such young technology now so they’re not left behind when it matures. No matter how simple your bot is, keep improving it over time with the help of Bitext state-of-the-art solutions services for bot automation. Don’t you think you should do something for your bot? Let's get in touch with us!